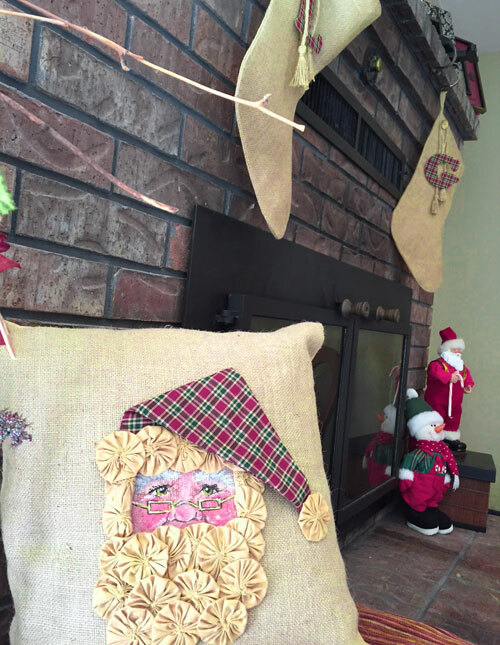 This crafty Santa pillow is one of my favorite holiday decorations! I started with a blank burlap pillow flat. 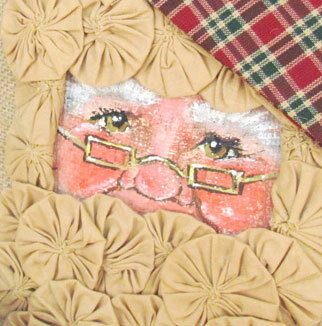 My talented friend, Annetta Gregory, painted this oh-so-cute Santa face directly onto the burlap. Santa's plaid homespun hat is made with our Red & Khaki 4 fabric and is whip stitched onto the front of the pillow after the face was painted. If you are making one of these, you'll want to unzip the pillow and keep one hand inside the pillow to catch the needle so that you don't accidentally stitch all the way through to the back of the pillow. Whip up some tan or white yoyos and glue them to the front of the pillow on top of the painted face, taking care not to let any glue seep through to the back side. Stuff your pillow flat with any 16" pillow that you may have sitting around (or you can buy a 16"-18" pillow insert from most hobby/craft stores). What makes this Santa project stand out is the yoyos for Santa's beard and hat. We chose the tea-dyed yoyos but white yoyos would also look cute! This concept could be used in many different Santa craft formats such as wall hangings on wood or stockings or any place where you'd find a Santa face. I'd even think that some Christmas printed fabrics might have a Santa face that you could use instead of painting one. You could also create a less lifelike Santa by using buttons for eyes etc. Here is a pic of my Santa burlap pillow displayed at home on my fireplace hearth.